Our warehouse wasn’t always this well-organised. Thanks to the hard work of two people, and their dedicated teams, our ‘Goods In’ and ‘Goods Out’ areas run even more effectively. It’s part of a wider initiative to improve efficiencies across the business by eliminating wastage. Glenn Crawshaw handles warehousing and internal logistics. Joanna Lewandowska is our Team Lead and Administrator for the Dispatch Warehouse. 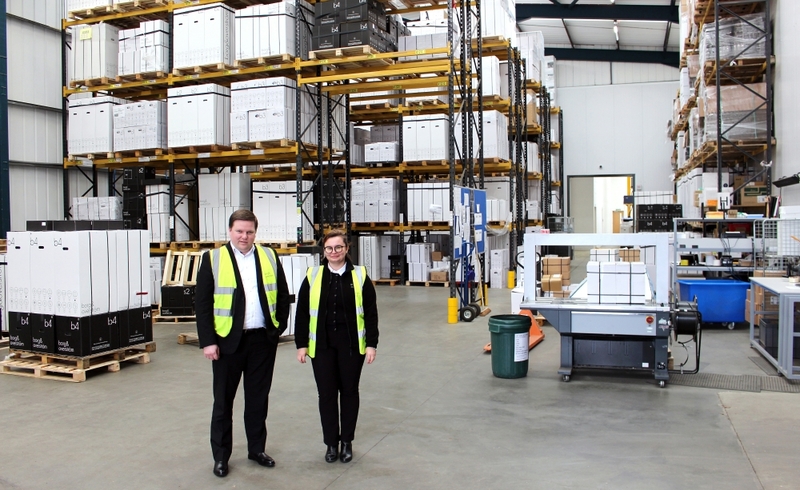 They’ve been working together to find more efficient ways of using the space, to ensure a continuous flow of goods onto and off the production line. Top priority for Glenn was re-organising the warehouse. Finding parts was too time-consuming, despite the introduction of a new computer barcode system. This sometimes held up production or stopped it altogether. “The number one goal in Goods In is to feed the line efficiently and on time,” Glenn explains. “We started by grouping similar appliances together on the racks and arranging them by popularity.” The appliance chassis that are used most often were also moved closer to the production line. Joanna also noticed inefficiencies in Goods Out. “There was no space, because of the pallets everywhere,” Joanna recalls. With valuable floor space taken up with palleted units, the team were struggling to wrap and label them effectively ready for dispatch. We value and reward good ideas and have recently introduced a new scheme to encourage more great ideas. Any team member is welcome to pitch an idea according to specific criteria. If a change results in a saving, we will give 10% of the 12-month saving to the team member who made the suggestion. Continuous improvement of our products and service is a team effort at Borg & Overström. If you’d like to join the Borg & Overström team, visit our careers page for current opportunities.